Even more efficient, even more energy saving! By installing and using lithium-ion batteries, Alkè offers its customers an even more efficient product. Exactly what are its advantages and what is different? 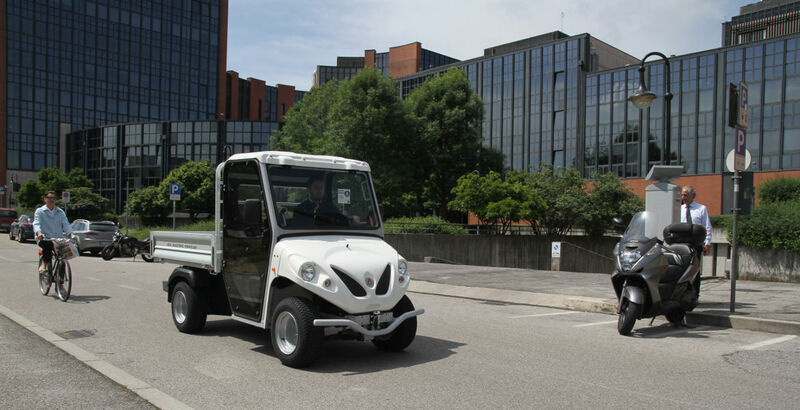 Alkè electric vehicles are, generally speaking, different from normal electric work vehicles because of the painstaking attention paid to detail and the quality of the materials used as well as the fact that they are environmentally friendly and energy saving. These qualities find their maximum expression in the lithium battery models which offer an even more beneficial level of consumption and an efficiency that is the hallmark of all Alkè products. Alkè electric vehicles with lithium batteries guarantee high performance as well as significant energy saving. The excellent 8 kW AC electric motor, which can also reach peaks of 14 kW, is what combines these two qualities. An important characteristic of this motor is the way it recovers energy during braking which offers greater stability when you brake (increasing driver safety) and considerably reduces the chance of losing control of the vehicle; there is also a significant increase in comfort and manoeuvrability when going downhill and a large reduction in consumption. Alkè offers a wide range of constantly evolving commercial and professional vehicles. This is why it now uses lithium batteries and can offer its customers more quality, performance and energy saving. These batteries have a number of positive aspects including excellent performance and duration both in terms of how long they remain charged and their overall service life: they perish much less rapidly than normal batteries. As you can see in the graph, the charge curve goes from 0% to 100% in less than 3 hours using a normal household power socket. In addition to full recharging, the system has also equalised the batteries, i.e. it has brought all the cells in the battery set to the same voltage level, making it even more efficient and long lasting. Max. speed 44 km/h Maximum speed is approximate and obtained on a flat surface, in optimum usage conditions, in SPORT mode. Autonomy 70 km Maximum autonomy is approximate and obtained on a flat surface, in optimum usage conditions, in ECO mode with energy saver and adopting a correct driving manner, at a maximum speed of 30 km/h. Vehicle width 127 cm Extremely compact, it can operate in limited space. The loading area is 180 cm long. One interesting point concerning this type of battery is its consistency: with conventional batteries, a vehicle may slow down and lose efficiency and power at the end of the day because they are running out of charge; with lithium batteries, on the other hand, the electric vehicle will never lose efficiency but will stop once the battery is completely discharged. Lithium batteries are also more compact in size and consequently the battery compartment can be reduced or power increased if the standard battery compartment is maintained. Recharging is better and quicker with lithium batteries. It is also a good idea not to wait for the vehicle to be fully discharged before recharging it, since lithium batteries tend to keep better and last longer if charged often. Finally, the BMS (Battery Management System) is also worthy of note. With this integrated battery monitoring system, you can trace all aspects of battery status, from its condition to charging.